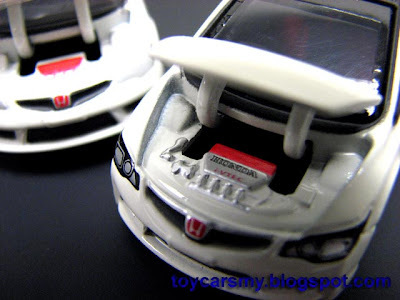 It is not easy to get one Tomica Limited Civic Type-R for this review. Some background of the Limited series, it was sold-off within 30 minutes at the day it arrived at the Hobby Shop. This is due to large quantity was purchased with pre-arrangement. Let's come back to this topic, with almost double price (RM23.90), the limited offers more detailed finishing as describe here. 1. 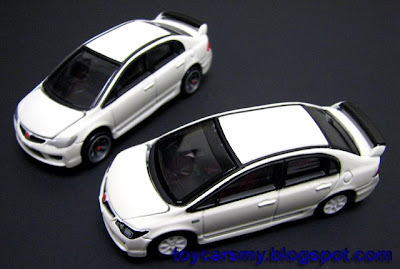 Rubber Tyres with White Rims follow the real Type-R design. 2. Black smoked effect head lights. 3. Clear red with orange coloured rear lights. 4. 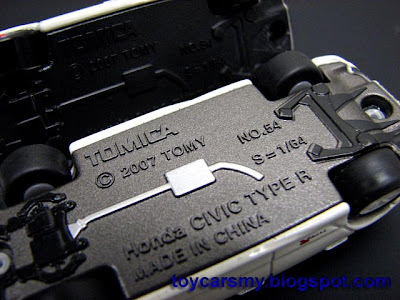 Civic Type-R rear number plate. 5. 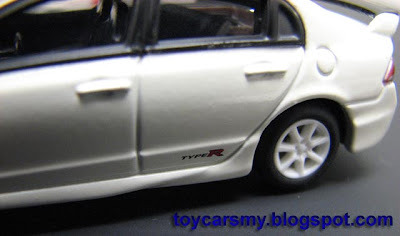 Type-R emblem at both rear doors. 6. 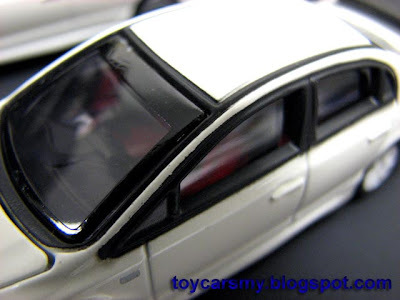 Black coloured front and rear wind screen. 7. Red coloured front and rear seats. 8. Honda Civic i-Vtec emblem at engine bay. 10. Metallic brown coloured base. There are few negative feedbacks on the QC of the Limited Civic compared to its regular. Most of the Civic were delivered with minor scratches or imperfection on the paint works. But whether you like it or not, it is no doubt a hot item in town. As for me, I'm okay with the custom regular Civic. Just wonder will the limited looks better if I fix it with the custom wheels? 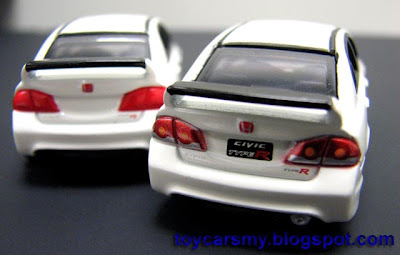 Remark: Both regular and Limited Civic Type-R are not available in Malaysia. According to my colleague in Singapore, both are rarely see too. Hi Mr. Yeo, as most of your customized cars, can you let me know which branch of donor wheels? They look good. Tom, There are from Hot Wheels Ferrari series. Oh.. I see. I had some Ferrari Series but.. I cannot use them as donors... hic..
the 54 normal Civic can be found in singapore Bugis BHG... it was restock last week.. Yes, regular Civic just was restocked in Vietnam too.